Whether for a school-lunch sandwich filling, a fancy picnic spread or on top of some greens, egg salad provides plenty of protein to fuel your body. While most recipes contain the same basic ingredients -- eggs, mayonnaise, herbs and spices -- small variations can result in huge nutritional differences. Homemade egg salad recipes tend to be much healthier than the commercially available prepackaged varieties. 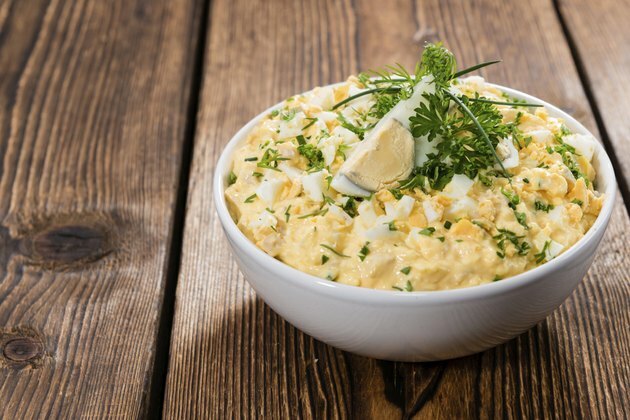 Classic egg-salad recipes combine eggs and mayonnaise with a little lemon juice, celery and chopped onion. Simple homemade versions pack about 220 total calories per 1/2-cup serving. If made with low-calorie mayonnaise, the calorie total decreases by about 40 per serving. The total calories in commercially available versions, meanwhile, range from about 220 to almost 500 calories per 1/2-cup serving, the Zeer website calculates. Egg salad contains about 19 grams of fat per 1/2-cup serving; both eggs and mayonnaise contribute to its overall fat content. One whole egg contains about 4.8 grams of fat, half of which is saturated fat. Mayonnaise contains about 10 grams of fat per tablespoon, or 5 grams of fat for light mayonnaise versions, 1/10 of which is saturated. Saturated fat increases your risk for heart disease by raising your levels of LDL, or "bad," cholesterol, according to the American Heart Association. One 1/2-cup serving of homemade egg salad provides about 30 percent of your daily recommended intake of fat. Commercially available brands can provide more than that, some as much as 75 percent of your daily recommended limit. Classic egg salad recipes provide almost 10 grams of protein per 1/2-cup serving, or about 20 percent of your total daily requirement. Commercially available prepackaged egg salads contain roughly the same amount. Eggs provide the bulk of the protein, about 6 grams per egg. Most Americans obtain 15 percent of their calories from protein, but, according to the Harvard School of Public Health, increasing your protein intake to 20 to 25 percent of your total calories can reduce the risk of heart disease, particularly if the extra protein replaces refined carbohydrates. The amount of sodium in egg salad varies considerably among different recipes and brands. Most people add salt "to taste," while prepackaged varieties come pre-salted. The U.S. government's 2010 Dietary Guidelines for Americans as well as the Institute of Medicine recommend that healthy adults limit sodium to no more than 1,500 to 2,300 milligrams per day. Using 1/4 teaspoon salt in a homemade recipe, along with mayonnaise that also contains sodium, will bring egg salad's sodium content to about 330 milligrams per 1/2-cup serving. Commercially available brands range from 550 to almost 1,000 milligrams per 1/2-cup serving, or nearly 2/3 of your daily recommended limit.